Here's what I've been working on, at least for starting out this would be the build minus one of the 1u quadratts. 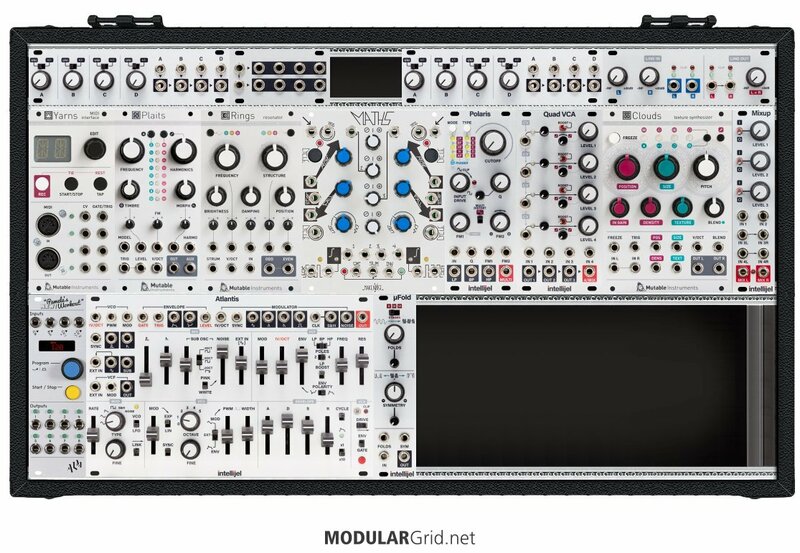 I'm looking to have a rack that can cover a lot of territory creatively from generative ambient, house, and Idm, to Berlin school. I'm doing my build in the intellijel 7u 104hp case. I'm looking to use a digitakt as my main seuqnecer and drum machine but that's where I've been having some headaches with using that in conjunction with yarns and Pamela's new workout. I was thinking about usuing a midi splitter as well to take advantage of the 1u intellijel midi interface as a way to clock pams and yarns together from the digitakt. If anyone else has some thoughts on arrangements or more modules to fill the empty space I'll have while starting out that would he wonderful. I'm definitely wanting to add a delay module down the line, possibly the 4ms DLD or the Strymkn Magneto. Critical options more than welcome. One rookie mistake I made was to remain unaware of the micro versions of MI modules, esp Plaits, Clouds, but I believe Yarns and Rings are also available. Michigan Synth Works has some nice ones and there are pre-assembled Antumbra modules on eBay. So your Plaits and Clouds shrink to 8 HP and you can squeeze in some other neat stuff. Also, are you dead set on the Atlantis? Seems rather voluminous for the HP. You could add a XAOC Zadar for 8(!) ADSR envelopes or Stages and a flexible OSC. Regarding the Polaris: check out Three Sisters and the new QPAS, as they might offer some more flavor. Also, a dedicated sequencer on the modular seems like something you might want. Rene MKII reigns supreme, but the Mimetic Digitalis is a superb and compact 4 track 16 step sequencer at 10 HP. Disting MK4 seems to be missing and the Poti is a neat expansion of the Batumi. Regarding clocking... how about a Hexinverter Mutant Brain instead of Yarns? Pam’s would then be your clock divider. Thanks for your response! I'm going to look into those micro MI modules. I'm pretty set on Atlantis as my main analog VCO because I love the SH-101 sound. I've heard good things about Three Sisters, I will just need to see how it compares to Polaris. As for sequencing I'm pretty set on using my digitakt. Is that why you mentioned the mutant brain? I've seen people talk about it correlation with the digitakt, but how would I go about running that with Pam's? Well...it's not exactly an SH-101 soundwise...the filter is very different, since the 101 had a "sort-of" 4-pole LPF, and the Atlantis is more of a "proper" 4-pole, albeit a multimode, plus it has that "boost" circuit. I'm actually shocked and amazed to say this...but if the SH-101 sound is what you need, that new Behringer clone actually nails the sound. I've been checking some of the NAMM videos of that, and it sounds exactly as I recall mine sounding...that same little bit of distortion in the suboctaves, the odd filter response nonlinearities as you open up either the cutoff or resonance, and so on. Plus it has the FM mod that a bunch of people added, and a much better sequencer. If that's the sound that appeals to you, it might make more sense to go there...plus you get a sequencer (with memories), arpeggiator, keyboard controller, and external main clock as well. And it's cheaper, and frees up 40 hp in the process. But the other reason for doing that is a very different thing from Intellijel: the Rainmaker. Common to the Berlin school, ambient (especially ambient dub), IDM, and generative is the need for a versatile and complex delay. The Rainmaker isn't small...but it has the power and flexibility needed to straddle all of those genres. At 36 hp, if you removed the Atlantis for one of the Behringer 101 clones, you'd then regain 4 hp from the Atlantis being removed and replaced. Digitakt: master sequencer and master clock. Drives Hexinverter Mutant Brain to derive 4 CV/gate pairs for modular + clock out. Pam's: trigger sequences, drive from Digitakt clock via Mutant Brain. 101: Digitakt clock (via Mutant Brain) drives 101 clock via EXT CLK IN or Pam's drives the same with a trigger pattern. Manually play kybd for live arpeggiation or bring in extra sequencer line for live counterpoint against Digitakt's patterns. This way, everything locks up to the same clock source, with an interesting option on how to clock/step that manual arpeggiator and/or extra monosynth line. I should have elaborated more on the sh101 vibe, I know the Atlantis isn't an exact clone but that's sort what made want it more from the demos I've heard. I appreciate that it can get in the realm of the 101 but can do much more. If I were to pull the Atlantis out of the rack I would probably go with a Malekko Manther. That box is wondeful, and what inspired me to pair a wavefolder with the Atlantis. I do like your idea of potentially replacing the Atlantis with a Rainmaker though. How does Rainmaker compare to the Strymon Magneto or the 4ms DLD? As far as the mutant brain with the digitakt, is there any reason to go with that instead of Yarns other than the HP? The Rainmaker is a very elaborate device: 16 taps, for starters. Each tap then has its own filter and also a granular pitch shifter, and then things start getting VERY crazy. Plus, it has a comb resonator with from 2 to 64 taps, which actually gives you one more voice in that you can use the comb resonator for Karplus-Strong "plucked string" modelling...or just use it as a tunable digital resonator which then can provide something like the Rings (which would then mean you could remove that too...more room!). Compared to the Strymon...well, it blows that out of the water, pretty much. The DLD, however, is not so much a delay as it is a dual looper...a delay with a buffer that loops, times two. The Rainmaker doesn't exactly do that, but it has a buffer "freeze" function, like the old one-shot delay/samplers of the early-mid 1980s, with control over buffer playback direction. If I were to sort of look at this simply, though...the DLD is a looper, the Magneto is a delay, and the Rainmaker is a time-domain instrument. More elaborate, ultimately, for only $40 more than the Strymon. The reason for using the Mutant Brain lies in the fact that you have the same amount of CV/gate pairs as the Yarns...AND eight more gate outs, which means you can assign (via MIDI Sysex) those to other gates, clocks, etc whatever, as long as its a 0-+5 gate/trigger output. This then allows you to run all four voices and the clock...and more besides...as opposed to the Yarns, where you only have that set of four paired CV/gates. The drawback is in not having the internal control the Yarns has, but only up to a point. Consider: if you can alter the MB with sysex, and reconfigure it on the fly, you can load sysex messages from the Digitakt that can alter the MB's gate/trigger allocations/parameters as needed, or from a computer connected through the Digitakt. In short, it's actually got a feature set that lends itself more to a clock-driven system such as this.